Today marked a special milestone for me on Twitter. 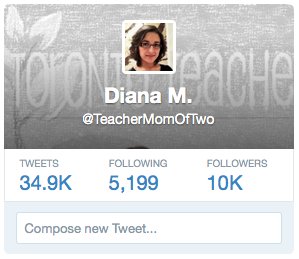 It was the day that I hit 10,000 followers and crossed over into the 5-digits. Some might say it's just a number. No big deal, right? Well, I beg to differ. For me, it's symbolic of the connections I have made over the last five years thanks to Twitter. While I can't say that I have truly connected with each and every one of my followers on a personal level, I feel extremely blessed knowing that I have made some real-life connections that have lead to new-found friendships with so many amazing people, I dare not name them all for fear of unintentionally excluding anyone. Granted, being an avid Twitter user has also allowed me to connect and converse with brands and well-known Canadian talent such as Wes 'Maestro' Williams, Gerry Dee and other cast members of CBC's Mr. D., Allan Hawco of Republic of Doyle, and Jully Black. There are also so many fun Twitter parties and contests to participate in and prizes to be won, like the $500 gift card I won recently from Walmart Canada. But, in all honesty, I am thankful for the glib repartee, the helpful suggestions, and the continual support of all those who have shared in the happy times, laughed at the lame jokes, and rejoiced in the successes. The fact that I have tweeted nearly 35,000 times and haven't scared off the entire Twitterverse makes me want to frolick in the virtual fields of the InterWeb and send out e-hugs to all my Tweeps. Five digits worth. Congratulations on 10K! It is a wonderful achievement, especially when you do it the old fashioned way - with great engagement! Thanks, Lena! I'll cheers to that! Congrats Diana! 10k is an amazing milestone accomplishment!